The Chinese electronics and technology company has now revealed that it has its own wearable technology prototype. The largest PC manufacturer in the world has now unveiled a prototype version of augmented reality glasses, which shows that the company is on its way to producing a wearable technology device that will place it in competition with Google Glass. This AR headset functions with a type of necklace like band to enhance the life of the battery. Lenovo, which is based in China, has unveiled the prototype of this device , which is a version of a wearable computer that bears somewhat of a resemblance to Google Glass, in that it is a headset that sits on the face in a way that is similar to eyeglasses. As is the case with the best known device in the augmented reality glasses category, the prototype appears to have a tiny screen – a small acrylic prism – onto which images are projected. That display is placed in front of the right eye of the wearer. These augmented reality glasses also contain a unit that houses processors and memory chips on the right arm. While that feature does help to improve the performance of the device, in the prototype, its right arm looked rather bulky as a result of the addition. The primary difference, in a visual sense, between the Lenovo AR glasses and the Google Glass is the battery pack which hangs around the back of the neck of the wearer, with a blue wire connecting it to the main device. Other than the actual overall appearance, there wasn’t much in terms of detail that was provided along with the unveiling of the device. That said, Lenovo has said that it will make a new series of announcements about what can be expected from this wearable technology, in October. 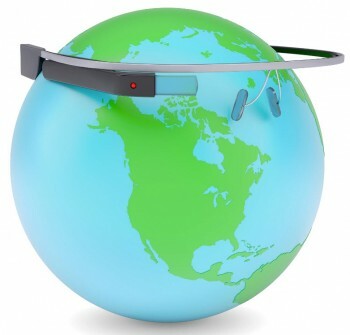 The prototype augmented reality glasses are one element of the NBD project at Lenovo, which is focused on the production of a range of different internet connected devices, such as fridges and toasters, and even air purifiers that are controllable through the use of a smartphone.